Varieties of marble slabs and tiles are produced mainly in Turkey, India, China, Italy, Greece. These are available in fascinating colours with lighter shades of white, beige, pink, yellow and have fascinated architects and interior designers in using marble slabs and tiles not only for flooring and countertops, but also for wall cladding for the interior. Pastel colours of marble provide light in the foyers, kitchens, bath rooms, stairs etc. For Centuries marble has been used as flooring material in temples, mosques, churches in addition to its wide spread use in malls, theaters, public buildings and residential houses. Marble has all the important characteristics, but it becomes cold in cold climate specially where temperature goes below 0o C. Walking on such floors on bare foot becomes difficult as floors are very cold. Such problems are encountered in USA, Canada, Russia, China and many countries of Northern Europe. 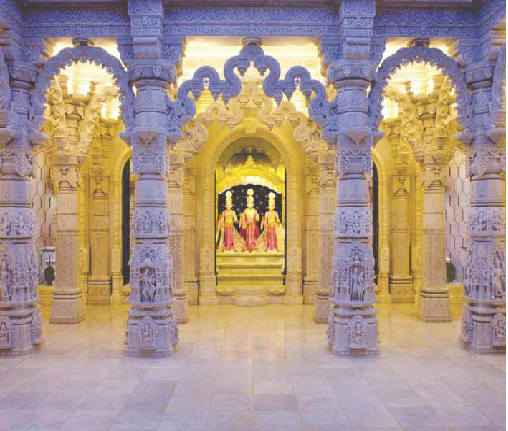 Indian temples all over the world – Swaminarain, ISKCON and others – have also extensively used marble for floors. Heating of such floors assumes greater importance. For a home with marble tile floors, everyone wants that feet are always warm and toasty even in the cold winter months. Marble, while a great choice for floors and counter-tops, can get really cold and uncomfortable. Floor warming is probably the best choice when it comes to ensuring floor remains at comfortable temperature throughout. Toe kick heater and in-floor heating are two main options when it comes to heating beautiful marble floors. In terms of pricing, the two options cost roughly the same. The total amount will be contingent mainly on the total square metre area of the space one wants to heat. In order to properly install radiant heating, it is important to measure the area of the floor and plot this on a graph paper while carefully noting which fixtures in the room to be heated. This is necessary to work out how many mats or toe kick heaters will be required. The best thing about toe kick heaters is that they require less work because they are not installed underneath the marble tiles. For a small bathroom with a vanity, toe kick heaters are a good choice as one has to install the unit at the base of the vanity sink cabinet. The downside of toe kick heater is that there is usually a lot of electrical work required to get these installed. Usually the heaters are 120 volt, so tapping into an existing circuit might be sufficient. This type of heating is best done before installing marble tile floor. As such, it is a good option for a homeowner who is looking to remodel their bathroom or who is building a new bathroom. For existing bathrooms, installing this heating might be a lot of work and expensive as well. For the installation, one has to gently secure the heating mats in place underneath the tiles. Use of glue, staples or double-sided tape is recommended. The heating mats are interconnected to form a complete circuit in order to ensure that the heat is evenly distributed to the floor. Heated floors are becoming increasingly popular among homeowners because of several reasons. For starters, no one likes to live in a cold house. Secondly, no one wants to spend a fortune heating their home when they could do it for less. Heated flooring solves this problem by ensuring that your home stays warm and toasty and your heating bills are much lower than they would be if you relied solely on HVAC. Lastly, heated flooring increases the home value, ensuring a good price if one decides to re-sell. While heating of marble floors may not be required in most of the cities in India except some northern cities in Himalayan Valleys, but it needs to be provided in Indian temples, churches and mosques as also in other places in cold countries. The temperature has to be controlled properly so that marble does not crack with passage of time as it would mean cyclic heating and cooling.